The United States issued a security alert for the Philippine capital of Manila on Friday, warning its citizens they could be the target of an unspecified attack. The US embassy in Manila released a statement calling for US citizens to exercise extreme caution and consider cancelling American gatherings in the sprawling and chaotic megacity of 15 million people. The statement said US Ambassador Harry Thomas had ordered stepped-up security for all US government facilities in Manila. 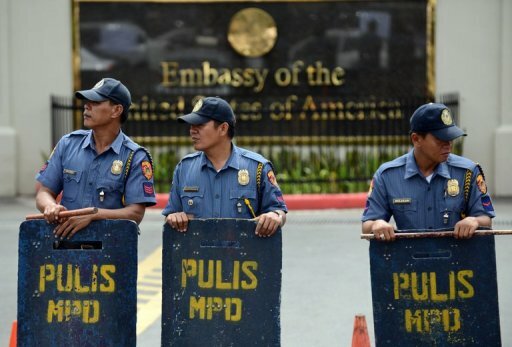 Pasay, a major district in the capital, is home to a heavily guarded US embassy compound called Seafront that contains housing for diplomats, a library, an outpatient clinic and a clubhouse. The compound is near the Philippine foreign department, as well as a red-light district that attracts foreigners. US embassy spokeswoman Tina Malone said she was unable to give any more details than were in the alert. Philippine Department of Foreign Affairs spokesman Raul Hernandez released a short statement following the alert saying the government was working to ensure the safety of US citizens, but without giving further details. The US government issued an alert in November 2010 that warned of an attack in Manila, particularly areas frequented by foreigners. It prompted similar travel advisories by Britain, Australia, Canada, New Zealand and France. However the attack never materialised, and President Benigno Aquino subsequently criticised the United States and other Western allies for damaging his country’s tourism prospects. The foreign governments eventually lifted their warnings for Manila. The United States has a general warning about the risks of travel in the Philippines, a former US colony that has for decades battled Islamic separatist rebels and more hardline Muslim militants in the far south of the country. A longstanding general warning cautions US citizens to avoid areas of the southern island of Mindanao, about 850 kilometres (530 miles) from Manila, because of the threat of kidnappings. The Abu Sayyaf, a small band of Muslim militants that authorities say was set up in the early 1990s with funds from the Al Qaeda network, has kidnapped and killed Americans in Mindanao. About 600 US troops have been rotating through the southern Philippines for a decade to help train local troops in hunting the Abu Sayyaf. However the Americans are barred from taking part in combat.